NeverSeconds: Here comes the Hungry Birds! Here comes the Hungry Birds! phones). We come from Mikkeli which is a small town in Eastern Finland. something about history of school meals in Finland. is usually bread, cereals, fruit or yoghourt and glass of milk or juice. eat nomally small afternoon snack at home. It is usually bread or fruit. eat some snack before we go to sleep. drink. There is also bread everyday but the bread is mostly crisp bread. Today the spaghetti was integral pasta which is of course healthier. There is also a very small amount of fat and salt in the sauce. This is all for today! Hungry Birds will be back tomorrow! cool, finland rules! Proud of my home country (:: school food isn't always awesome but it's free! Did I understand it right that you eat your breakfast also at school? And is it also free? Or do you bring it with you from home? Hi! I'm a Finn too (though not in Finland at the moment) and pupils/students don't eat breakfast at school, they eat it at home. Usually schools just provide a free lunch. There are some special shools, but those are exceptions. I believe the breakfast is at home.. :) Also from finland, woo! and that bolognese looks very familiar what we used to have, but that's like, ages ago.. :D and I hated it. used to call it ratsauce.. :DDD but it's free. What is on the crip bread and is that a ketchup like sauce next to the bolagnese? I had to Google "integral pasta." We call it whole wheat pasta in Canada. Is that ketchup on the plate beside the pasta? I must admit, I got rather a chuckle out of the photo. LARGE portion of spaghetti. Little tiny portion (perhaps two bites) of salad. Interesting! Looks a lot like the spaghetti and meat sauce they served many moons ago when I was in elementary school in the U.S. One question, though. Is "sour milk" what's known as "buttermilk" in the states? Nice work and looking forward to future posts! Yup. "piimää" translates to "buttermilk" in English. I wondered about that, too. I'm sorry. 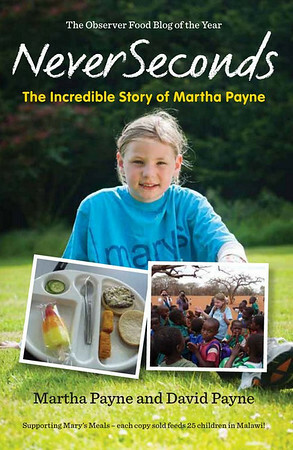 I love the website, love Mary's Meals and I love Veg. But I have to be honest with you - that looks disgusting. I'm glad they don't charge you for it, but as we say in the States, you get what you pay for. It's actually quite interesting how a such a normal school lunch can look disgusting for someone else. And then again we in Finland are surprised to see school lunches including potato chips, hamburgers, pizzas and even candy. It's also a surprise for me that in some countries/schools you have dessert everyday with your lunch. We rarely have dessert at school in Finland and when we do it's usually on a peasoup day (and on a Thursday, then we can have pannukakku (http://img.mtv3.fi/mn_kuvat/mtv3/koti/ohjelmat/makuja/ruokakuvat/syksyn_reseptit_2008/588411.jpg). There's a couple of reasons why I think this meal looks a bit strange. 1st - the color of the picture is a bit off. It's all a bit too dark, as you can see by the buttermilk, which should be white but looks greyish in the picture. 2nd - integral pasta spaghetti are a bit darker than normal spaghetti, due to the fact that they contain whole wheat..
3rd - I might be wrong, but the Bolognese looks more like the Ragù alla bolognese I make at home, which is like the italians do their Bolognese. It's not made from "hamburger" meat/minced meat/ground meat but from meat that's pot roasted 'til it nearly falls apart on itself. There's a lot of vegetables in the sauce too. And it hasn't this bright red look that the "hamburger" meat/minced meat/ground meat Bolognese usually has..
Ahhh, "pea soup days"!! That takes me back to my days of living in Holland when we had pea soup days, or Erwtensoep as they call it. Lovely!! I don't think it looks disgusting! I think the processed burgers and pizza look way worse. This looks like real food, and good for Finland for teaching children how to also be POLITE about the food they are being served. This is something Americans can be horrible about. I think that sour milk is almost same as butter milk. I think it is known in US as Wasabread (according to label Wasa who has brought it first to the US market). Usually made out of rye. Yam! And butter is not real butter, but the healthier option... what is it called? Crisp bread I think goes by the name of "wasabread" in the US. (Wasa was the label that brought it to the US market). And butter on the bread is not whole butter, but the healthier option. What is it called, with less unhealthy fats in it? 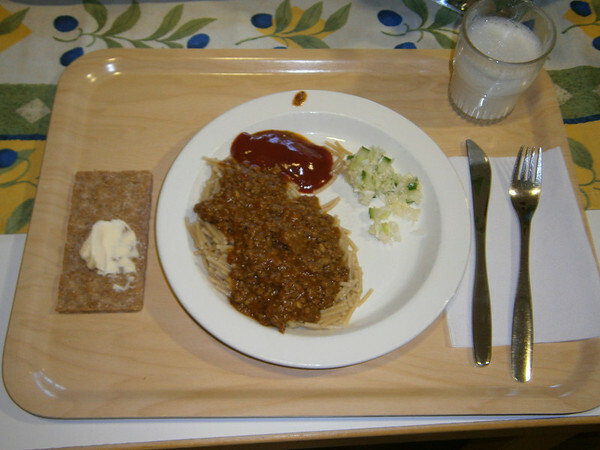 In finnish schools that "bolognese" sauce doesn't contain much tomato (maybe not at all) so it isn't that red bolognese usually is. In fact in our school I think it's called just minced meat sauce. It's not the world's best food but it's still free for us (our parents pay taxes so they kinda pay for our lunches afterall) and I have to say that pasta with minced meat sauce is one of the favourites in our school also (our pupils are 13-15) while pyttipannu (http://en.wikipedia.org/wiki/Pyttipanna, traditional finnish pyttipannu looks like the one in the lower picture) might be the number one of all favourites. Yes, we REALLY don't have pizza, hamburgers etc etc. Like the wikipedia page said, nowadays it's also made from fresh ingredients but in the beginning first pyttipannus were made of leftovers. Fried egg on the top of pyttipannu is some kind of old tradition, e.g. in school we don't have egg with it, and thank god we don't 'cause I don't like eggs. Usually we eat pyttipannu with ketchup, those who don't like ketchup or don't like pyttipannu with ketchup eat it just plain. Does everyone go home at 2pm? What happens if both your parents work? Many schools organise after-school activities (music, sports etc. or even homework clubs) that kids can attend for a small fee. For the fee they also get an afternoon snack. Or kids may have their lessons at music schools or sports practice right after school hours. Some have older siblings who look after them until parents come home. Some may even go home alone and then play with their friends during the afternoon. That's what we normally did in the 1980's when I went to school.